We are all faster and more creative when addressing someone else’s problem than when we’re addressing our own. This is why even the greatest surgeon doesn’t operate on himself. Read the short puzzle below and try to figure out how the prisoner escaped. A prisoner desperately wants to escape. One day he discovers a rope in his cell. Trouble is, the rope is only half the length necessary to allow him to reach the ground safely. Yet he divides the rope in half, ties the two parts together, and escapes to his freedom. 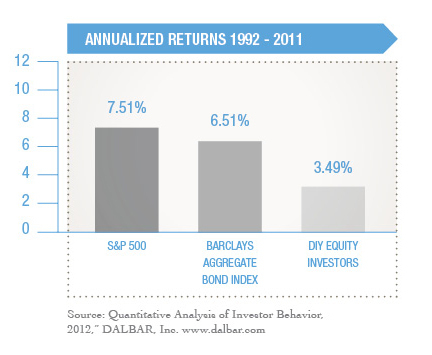 After conducting this year’s Quantitative Analysis of Investor Behavior (QAIB), Dalbar found that in 2011, the average equity fund investor underperformed the S&P 500 by 7.85%. The poor performance shows that psychological factors continue to harm the average investor and the remedies for these behaviors remain a work in progress. The chart below shows the performance of the Do-It-Yourself (DIY) investor for the last twenty years. 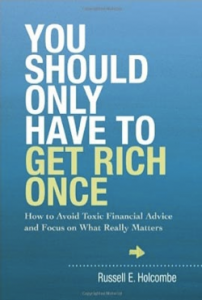 Unfortunately, the DIY model of investing usually leads to tragically poor results. The average DIY investor uses the rope to tie a noose rather than finding freedom. Increase the odds of achieving your Point of Independence; make it a new year’s priority to hire a very good financial planner.